It is impossible to put into words how much Zlatan Ibrahimovic has meant to Swedish football. There will be a huge vakuum after him when he finally hangs up his boots. We already feel his absence in the national team. During the first months after the Euros, when Zlatan said goodbye to Blågult, the interest in the team has decreased. We have seen it in the reduced attendance at Friends Arena and in the decreasing amount of tv viewers. And since more senior players decided to quit Sweden as well this summer new coach Janne Andersson basically has had to create a new team, without big stars. This has resulted in a younger and more homogeneous group filled with – for many fans – a lot of anonymous players. That's why we decided to ask our Forza Football users in Sweden which of the "new" players they liked the best. We were pretty sure that the popular Celta forward John Guidetti, who certainly knows how to charm the crowd and tv viewers, would be the clear fan favourite. 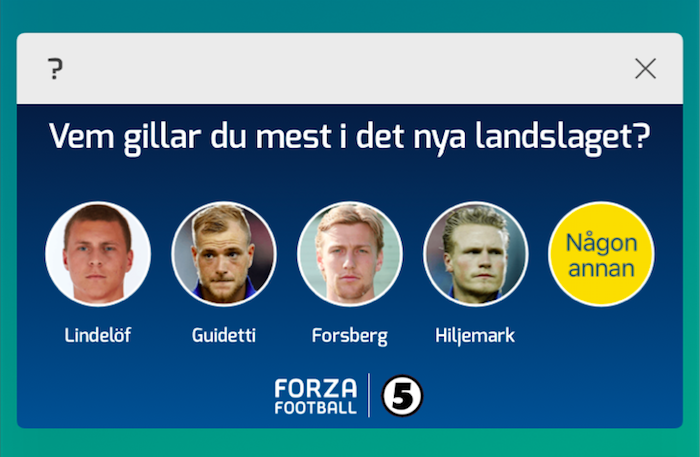 Over 10 000 people participated in the poll and the majority of them (35%) voted for Guidetti's good friend Victor Nilsson Lindelöf. The result was a big surprise for us even if the 22-year-old Benfica defender has performed on top level for his club and country lately. How to analyse that result? The poll was conducted during the first week of November 2016. Up until then the new national team had not really impressed anyone. Sure, they got a lucky point at home against the Netherlands and won in Luxemburg and vs Bulgaria. But nobody got carried away with the performances or got their hopes up about the future. Was Nilsson Lindelöf the chosen one only because nobody else stood out in those matches? Because he plays for regularly the biggest club, in the Champions League? Your guess is as good as ours. Maybe we can get some experts' view on this. Feel free to quote the poll data! Anyhow. Last Friday something happened at Stade de France in Paris. Something changed in how we view this team. Sweden lost the tough qualifier away to France (2-1) but the football, attitude and self-belief that the players showed were really good and inspiring. All of a sudden we have sort of fallen in love with this national team again. Okay, that's maybe an exaggeration but we are at least smitten again. There is no Zlatan anymore, and no stars, but Sweden played as a strong collective and they did not back down. They could (should?) have won against France and now this positive feeling has taken over. What would happen if we conducted the poll above again and added a new alternative to the question "Which player do you like the most?"